Unabridged. To see the original review, click here. If you have the discipline to sit down and watch two DVDs which feature almost exclusively the note D, the exercises presented here are bound to work for you. You may find it easy enough to improve your or your students' tone by simply reading what the method books have to say about effective bow use. However, Simon Fischer has painstakingly studied and applied these ideas over many years and has come up with five simple exercises that both distil and expand upon them. Here, Fischer isolates the elements of playing in order to understand each one fully. If you are clear that there are three elements in tone production: the soundpoint, bow speed and bow pressure, then you can thoroughly explore what difference each one can make by keeping two elements constant while varying the third. Fischer applies each exercise with students aged between 11 and 20. Hearing each exercise played well, you know exactly the quality of tone to aim for and you can also see the comon pitfalls. Perhaps most importantly you understand just how meticulous a player needs to be to play them without blemish. This DVD could be the very thing you need to improve and maintain your playing, or to set a less advanced player on the right tracks. The tagline (The Ultimate Lesson For Every String Player) makes a bold claim and one that is, in my opinion, fully justified. 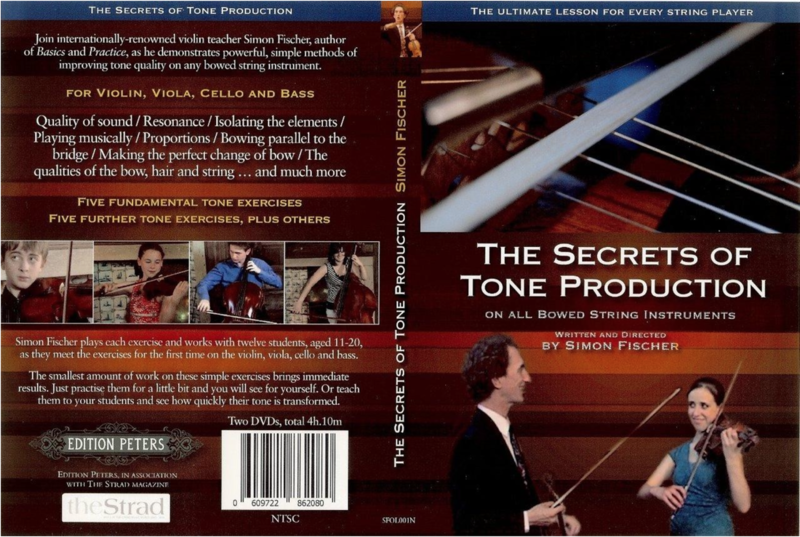 The Secrets of Tone Production, a four-hour DVD set, is based on a class Fischer has given many times over the past 20 years. In a series of carefully sequenced chapters (handily bookmarked for ease of use) Fischer alternates between explanations of each exercise straight to camera, complete with demonstrations, and calm, concentrated work with twelve students aged eleven to twenty, including cellists and bassists. The work is at once detailed and very simple, and the feedback that Fischer gives makes the content extremely accessible to students working either alone or with their teachers. The concept of the DVD is simple. Everything can be broken down into easily learnt steps. Both beginners and advanced players face the same problems - they're just harder to spot in those playing at a higher level. Fischer also cites Casals as a role model in his insistence on daily technical practice and points out areas of overlap between their approaches. His combination of formidable authority, clarity and generosity makes Fischer a beacon for both players and pedagogues.